Paperback / 6″ x 9″ / 224 pgs. Experience God in Creation. Nurture a heart of wonder. 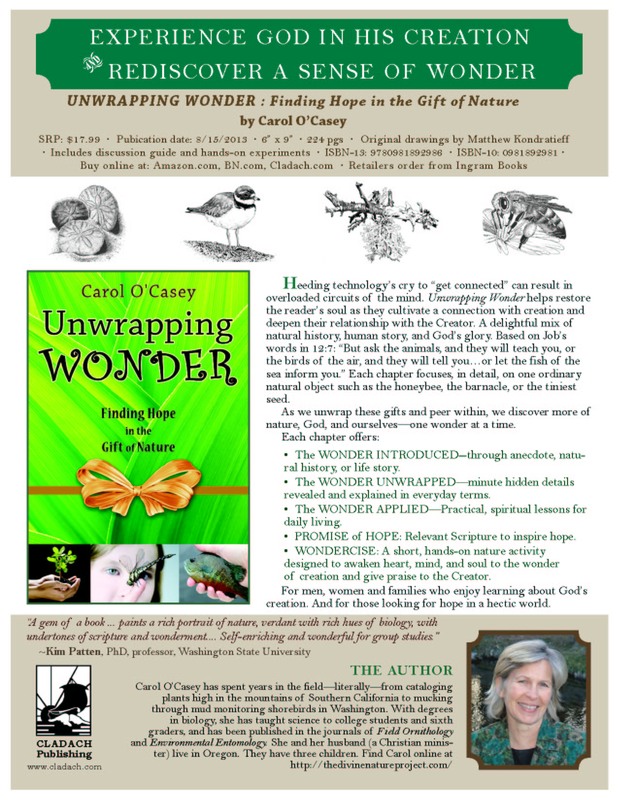 Unwrapping Wonder offers a delightful mix of natural history, human story, and God’s glory. Each chapter “unwraps” one object of nature such as the barnacle, the honey bee, the tiniest seed. As readers peer within these gifts, they discover more of nature, God, and themselves. Heeding technology’s cry to “get connected” can result in overloaded circuits of the mind. Frenetic connections can cause frazzled lives. Step outside to cultivate a connection with creation and deepen your relationship with the Creator. The Wonder Introduced — through anecdote, natural history, or life story. The Wonder Unwrapped — minute hidden details revealed and explained in everyday terms. The Wonder Applied — Practical, spiritual lessons for daily living. Promise of Hope — Relevant Scripture to inspire hope. “Wondercise” — A short, hands-on nature activity designed to awaken heart, mind and soul to the wonder of creation and give praise to the Creator.